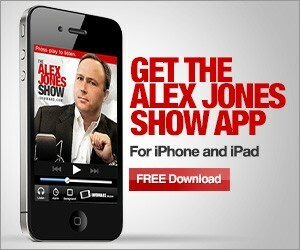 Note from Alex Jones: This represents the process of full spectrum dominance over our children’s minds. First the government paid the mothers not to have husbands in the home (single parent benefits) and now the soldiers are bringing up our kids from Kindergarten age. This is about training Americans almost from birth that’s it’s normal to have troops involved in routine life on a day to day basis. This is total martial law conditioning. In 1787, Thomas Jefferson lamented the fact that the newly minted Constitution lacked any specific provisions on standing armies. “I do not like the omission of a Bill of Rights providing clearly and without the aid of sophisms for… protection against standing armies,” Jefferson wrote Madison. “The spirit of this country is totally adverse to a large military force,” he told Chandler Price in 1807. 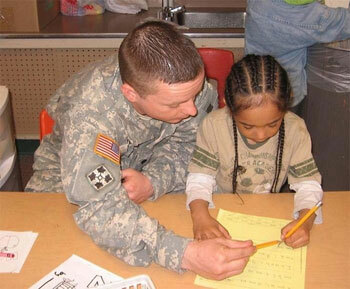 A soldier works with a kindergarten student at Chester Valley Elementary School in Anchorage, Alaska. Now? We relish large armies and enthusiastically send them out to kill people and break things around the world. The government and the corporate media encourage us to “support our troops” as they illegally occupy foreign lands and engage in war crimes. George Washington’s admonition, expressed in his Farewell Address, that the United States extend commercial relations and have with foreign nations as little political connection — to say nothing of military — as possible is almost entirely forgotten. In violation of Posse Comitatus — a law in the spirit of Thomas Jefferson’s warning about the militarization of civil society — the Pentagon works hand-in-hand with local law enforcement. Increasingly, militarized police are becoming an extension of the Defense Department, the Department of Homeland Security, and even the CIA and the FBI. Few seem to understand the grave danger of this tendency. If schools in Alaska want to help students academically, they would bring in scholars and education experts, not soldiers. Ideally, students should be home schooled and completely divorced from the pernicious influence of the military and the federal government. The effort in Alaska has little to do with test scores and literacy. It’s about inculcating the young to the presence of the military. Contrary to the warnings of Jefferson — who knew standing armies will invariably be employed to enslave the people — the U.S. military has over the span of several decades crept into nearly every public aspect of life. The military instinct in society is now second nature, so much so that a high school in South Carolina has automatically enrolled students in a Junior Reserve Officers Training Corps with little outrage or opposition. “The entire freshman class at Carvers Bay High School has been automatically enrolled in the Junior Reserve Officers Training Corps, a military-sponsored program that trains high school students in military discipline and concepts,” The Sun News in Myrtle Beach, South Carolina, reported this week. “The breaking men to military discipline is breaking their spirits to principles of passive obedience,” Jefferson wrote John Jay in 1778. It is not merely soldiers or would-be-soldiers in training who are expected to be passively obedient. In fact, the whole of society is now expected to react with passive obedience to an out of control military and federal government. A militarized police state — where soldiers and military technology are integrated within society — is sold to us as normal and admirable, especially since the advent of September 11, 2001 when cave-dwelling Muslims supposedly attacked us from afar. Jefferson’s “supremacy of the civil over the military” is now a thing of the past. The Pentagon has not only invaded our high schools, but may now be found in our grade schools teaching the very young and impressionable.